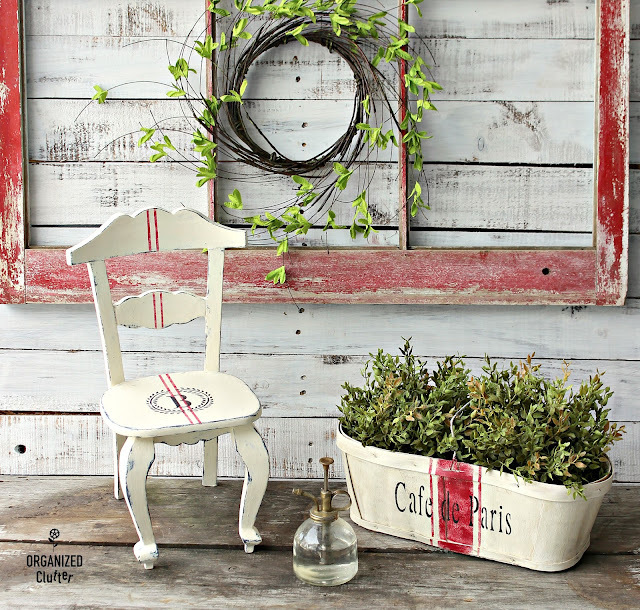 A rummage sale berry basket get a makeover. Read on to see the transformations! First I used a hair dryer to loosen up the iron on applique stuck on pretty tight to the seat of the little chair. Usually, the heat of a hair dryer will soften up the glue enough to remove an iron on or hot glue add on. I had to sand down the remaining glue outline of the flower. Next I painted the little chair with a black Rustoleum latex enamel in satin finish. I like to base coat with a latex black and then wet distress my chalk paint topcoats. Here is my little chair with two coats of Rust-Oleum Chalked Paint in Chiffon Cream. Then with a rag from an old tee shirt, I wet distressed the little chair. Wet distressing is really pretty easy. Just practice rubbing harder on the edges, and lighter on the middle of the piece with a damp rag. You can lightly or heavily distress with this technique. I like this technique because there is little mess. Also when the topcoat is wet distressed, the black undercoat does not get sanded away with sandpaper. 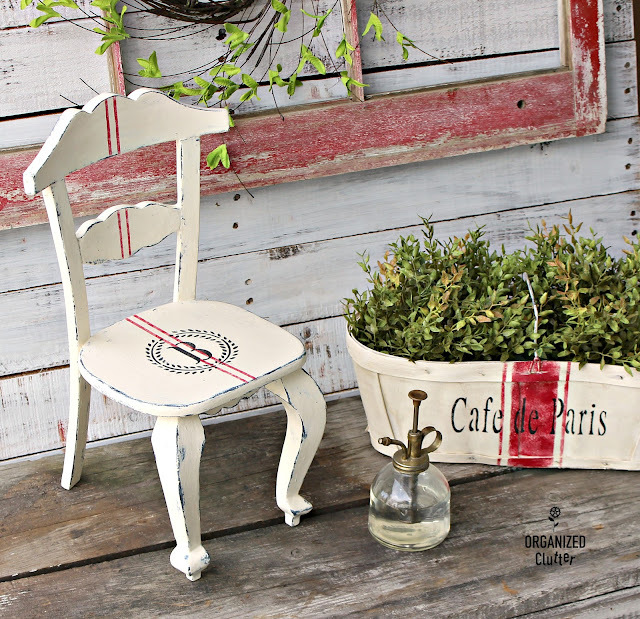 Now I'm going to give my little chair a little French vibe with a new *grain sack stripe stencil from Old Sign Stencils. Since my chair is small, I chose the G5 stencil with two thin lines. Tape the stencil to the back slats first, and then on to the seat. I stenciled on the design with Deco Art Chalky Finish Paint in Rouge . I used a very dry brush and a very light pounce so the lines would look faded. Then I added a "B" monogram with a stencil from Artminds, purchased at Michael's. I used black Ceramcoat craft paint to stencil the monogram. Lastly, I sealed the chalk paint and stencils with Varathane Crystal Clear Water-Based Polyurethane in Satin Finish . 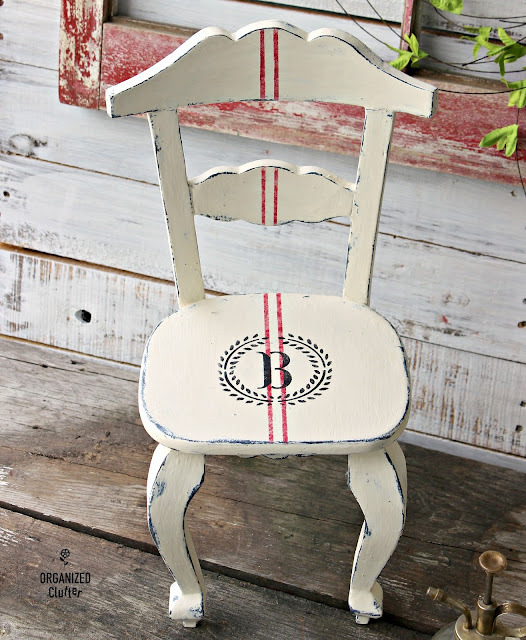 Here is the little chair with its new paint and stencils! I just used a plastic spoon to scoop out a couple spoonfuls of paint onto a Chinette paper plate with rim and added a little water. Stir in the water. When the white wash was dry, I pulled out the wide grain sack stencil from Old Sign Stencils. 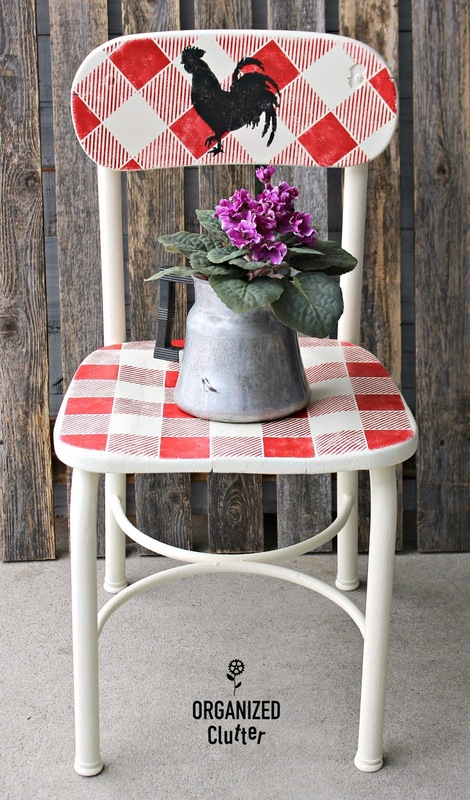 I stenciled it on the front using the DecoArt Rouge paint. 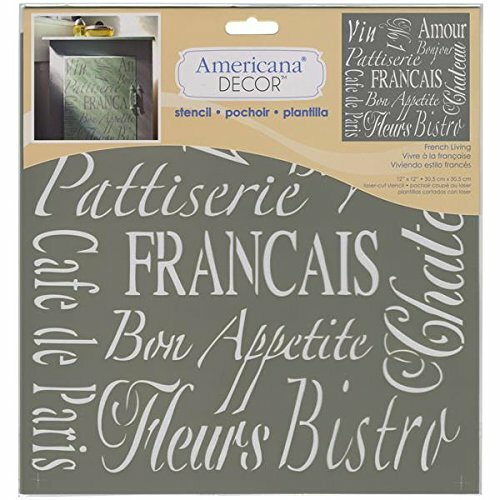 I then stenciled on "Cafe de Paris" using the Deco Art Stencil, French Living and Ceramcoat black craft paint. I also sealed the basket with Varathane water based poly. 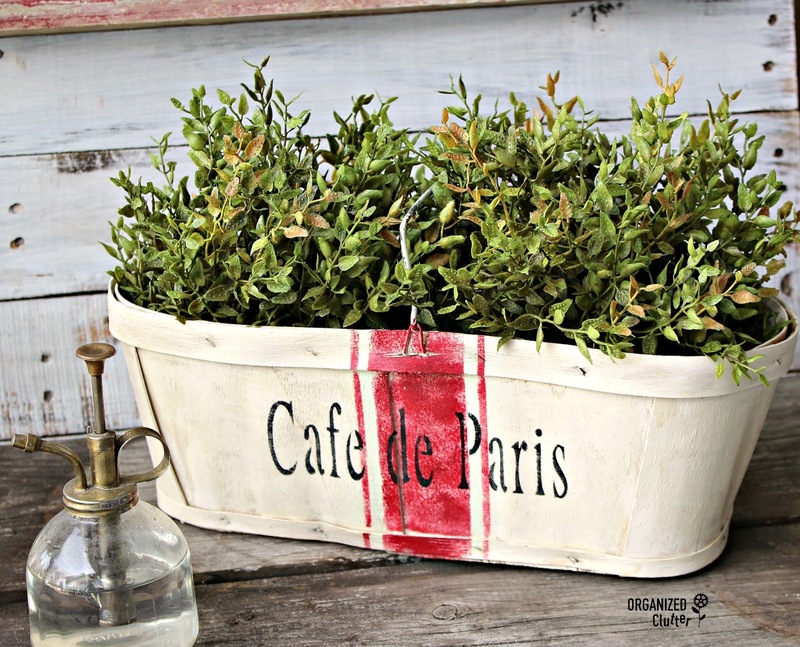 It's a pretty fun little French berry basket! The plants I added to my basket are from the Country House Collection, Baby's Grass Half Spheres . They seem spendy but they are very full. 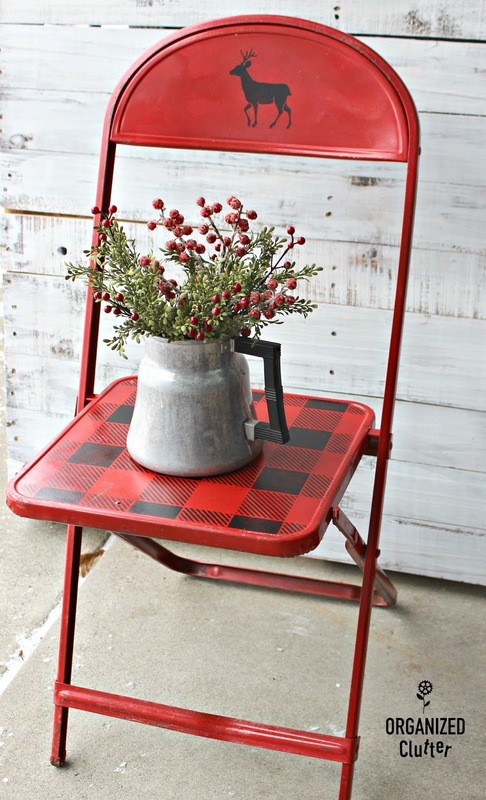 I love the cream paint, red stripes and black lettering. 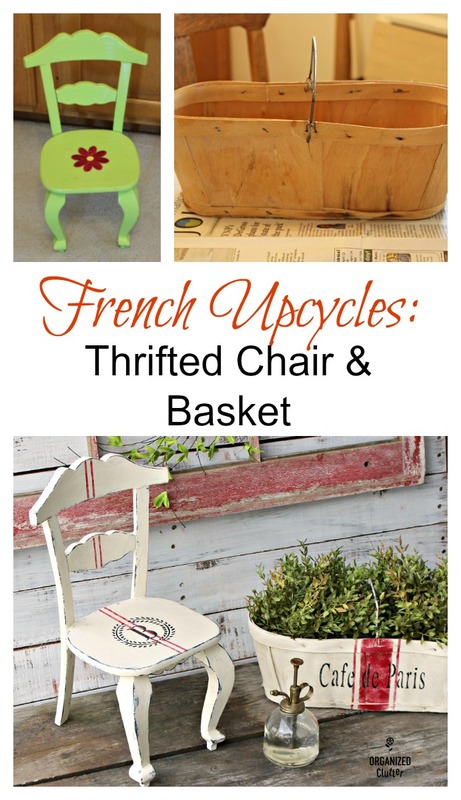 Two easy paint and stencil thrifted up-cycles, with grain sack stripe and French stencils! 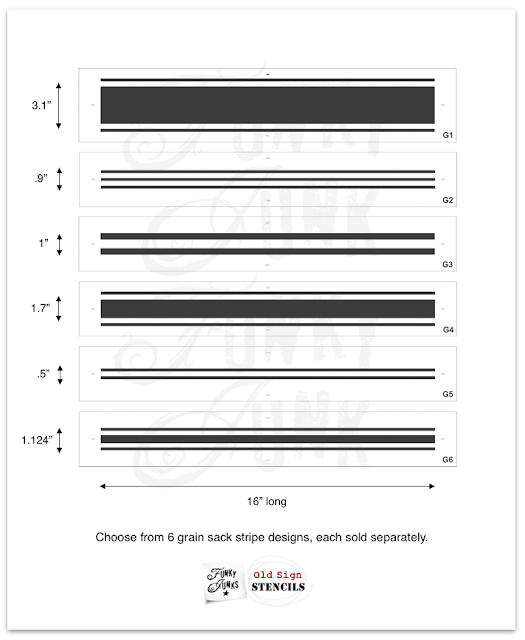 Oh my goodness... your grain sack stripes are, as always perfectly placed and teamed up perfectly with other designs and colours. Precious!